Week 6 in the NFL brought much more uniform action than usual. We saw everything from throwbacks to alternate jerseys to a white jersey at home from a team that never does and a team wearing colors, that never does. 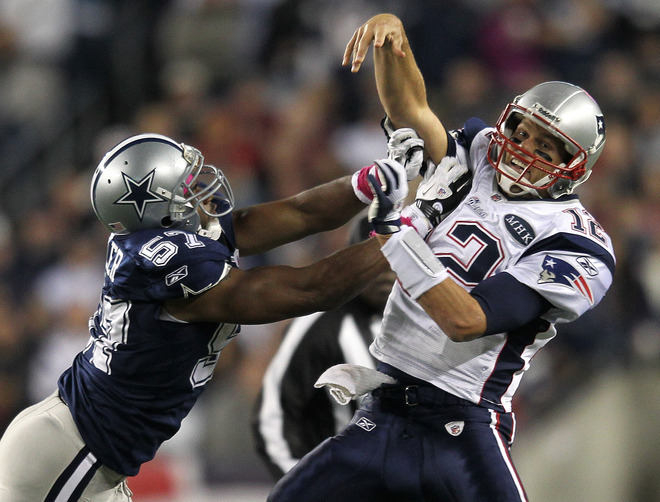 We’ll focus on the Patriots choice of white at home to force the Cowboys into their bad luck blues. While the Patriots seemed to be thrown off by the switch for much of the game, Tom Brady finally acclimated to the new threads in time to lead a game-winning drive in the game’s waning moments. It was truly a bold move by the Patriots to go with these white uniforms at home. The news came out earlier in the week that this would happen, and it would be to force to Cowboys into their road blues they have not worn in quite some time. As a Giants fan, I was in favor of this move, but I hope it does not become a trend among other teams in the NFL. The Cowboys road blues use a much darker blue and feature a star on the sides of the shoulders, a feature not seen in the usual home uniforms. They are certainly ugly uniforms and I understand why the Cowboys try to avoid wearing them at all costs. The Patriots uniforms are nice, pretty much a typical road jersey. New England could have also gone for a silver look they wore a few times in their past, and still forced the Cowboys to go with their blue uniforms. 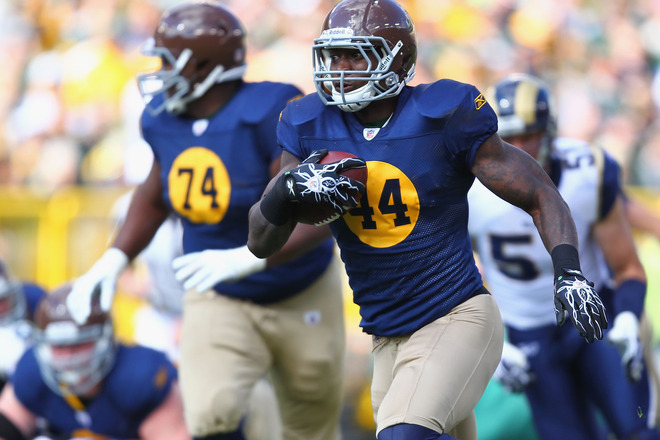 The Packers wore a 1920s throwback against the Rams on Sunday. The brown helmets are supposed to simulate a leather helmet the team wore back in the day. However, it ends up looking more like a Notre Dame uniform. The numbers in the circles are very strange, but I guess that’s what they did back in the 20s. The Bengals wore an orange alternate against the Colts. They are not as good as the usual black uniforms, but not all that offensive since the helmet is also orange. The Falcons wore a very nice throwback in their victory over the Panthers. I love the red helmet along with the black jersey. It’s probably the best look Atlanta has ever worn.